(Newser) – The year on the reddish penny 16-year-old Don Lutes Jr. spotted in the change he got at his high school cafeteria in Pittsfield, Mass., in 1947 stood out—1943. 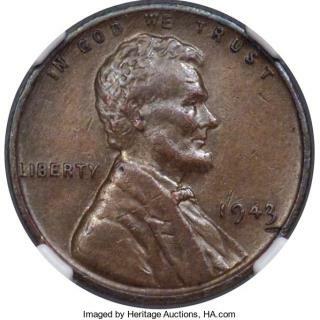 That year, amid the backdrop of World War II, the US Treasury minted zinc-coated steel pennies in an effort to conserve copper, though there were rumors that a handful of pennies had been minted with leftover copper planchets. There were even rumors that Henry Ford would give a free car to anyone who found one of the rarities, reports Atlas Obscura. Despite denials from both the Treasury and Ford Motor Company, what turned out to be "the Holy Grail of mint errors" remained in Lutes' collection for 72 years until his death in September, per Fox News. Now it could be yours. The 1943 copper penny—one of an estimated 20 minted—is up for grabs in an auction ending Thursday, with bidding currently at $120,000. As Ben Franklin is quoted, "a penny saved is a penny earned".